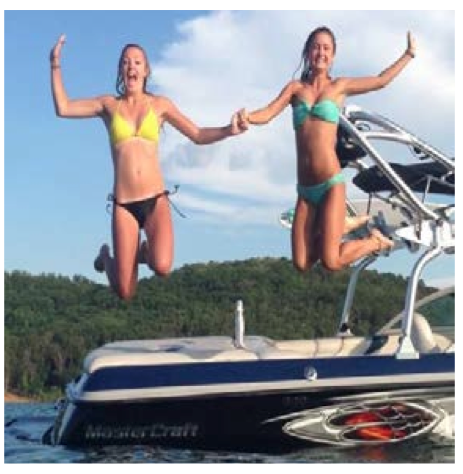 Jump in for a day of fun on beautiful Greers Ferry Lake. Known for its clear water, this 40,000 acre lake claims 340 miles of shoreline. Fairfield Bay hugs the beautiful “North Shore”. 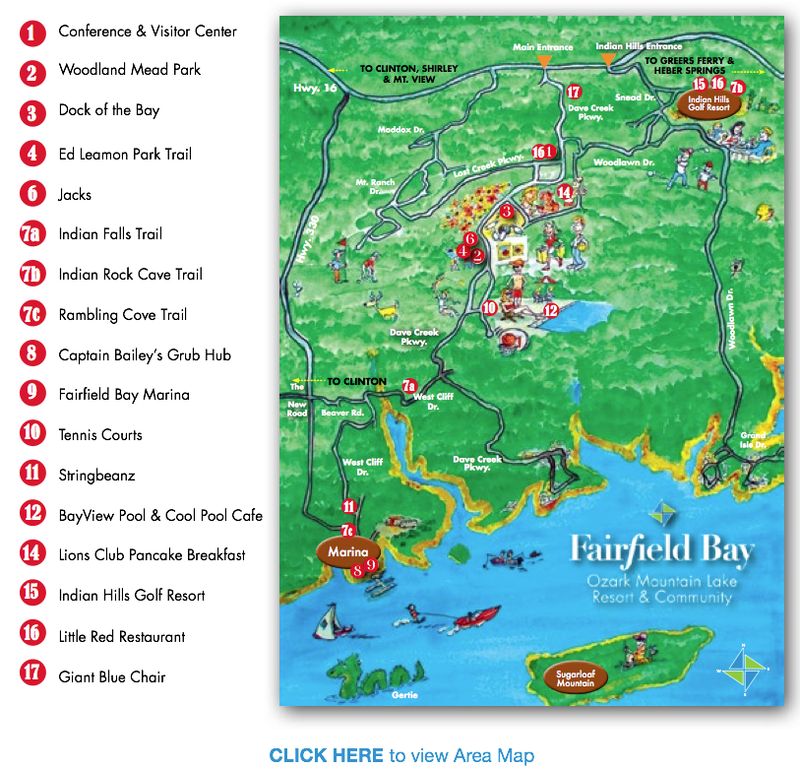 Fairfield Bay has a number of destinations where your family can have fun for a few hours or for the entire day! We know that families need flexibility, and The Bay has something for everyone. Your first day focuses on the outdoors at Woodland Mead Park. 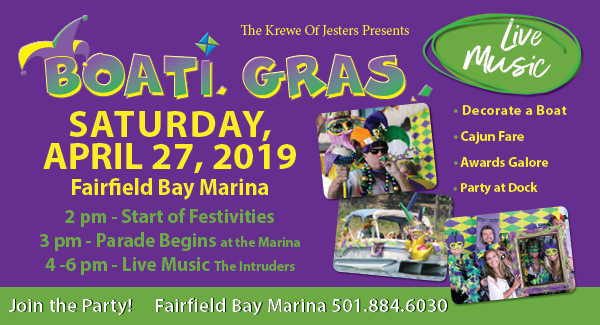 Day 2 offers recreation at the Tennis & Rec Center and WaterPlay at the marina. You’ll round out your stay on the third day with some of The Bay’s favorite spots not to be missed. Start with a quick visit to pick up all sorts of fantastic area information and maps. You’ll receive one-on-one attention as you chat with the center’s staff to get the inside scoop on special events and all the “goings on”. The staff can serve as your personal travel agents, making reservations for you, so all you need to do is show up! Ask about the different types of boats available—ski, kayak, fishing, pontoon—and other tours. They can also make dinner reservations or book tee times. If you think you’ll want a picnic dinner after Woodland Mead Park, ask for recommendations on where to pick up your goodies. There’s no shortage of rocks to climb and trails to explore. Critters and crevasses; parks and playgrounds; trails and tails (yes, dogs are welcome) are just a few of the fun things to be found in the days ahead. 2. Play Destination: Woodland Mead Park 2 p.m.
You’re in for a treat at Woodland Mead! Little feet have plenty of places to roam in this beautifully landscaped park that includes playground, miniature golf, trails and critters. There’s even a bit of history to absorb—look for a “thong tree” – used by generations of Native Americans to mark important spots – right at the entrance to the park. Right in between the two golf courses is a brand new, 9-hole disc golf course. It’s in the woods and crosses the hiking trail, so you might meet some other families out for an adventure. 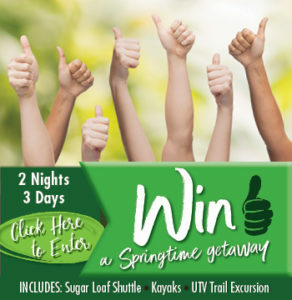 • Two miniature golf courses offer entirely different experiences for all ages. One course is Harris Cup certified, a great challenge. The other is located in a forest! • Right in between the two golf courses is a brand new, 9-hole disc golf course. It’s in the woods and crosses the hiking trail, so you might meet some other families out for an adventure. • A children’s playground is situated in the perfect place for younger kiddos to get their wiggles out. • For the older ones? Play basketball, volleyball, shuffleboard or horseshoes nearby. • Plenty of shady spots on soft grass provide the perfect place for a quick snooze. • You’ll appreciate “real bathrooms” (not portable toilets) for potty breaks. Grab your favorite colored club and ball, take your family to play an American pastime – mini golf. Fun putting challenges with elevated greens, water and landscape obstacles and more. Family and couple passes available. Ready for a TREAT? All this activity will work up an appetite. To tide you over til dinner, Yellow Snow offers a myriad of shaved ice flavors. Ask for a free taste if you’re unsure which flavor to choose. 3. Eats & Treats! 5:30 p.m.
You may opt to make it an evening at Woodland Mead Park with a picnic dinner—picnic tables are readily available. If you have a larger group, consider renting the pavilion. Or for another fun time, have supper at Dock of the Bay restaurant; the kids will love to feed the jukebox and dance! 4. Wander amongst Fairies! 7:00 p.m. The Ed Leamon Garden Trail is a gardener’s delight. This little oasis in the middle of town is home to rose gardens, butterfly gardens and even the elusive fairy gardens! Developed by Van Buren Master Gardeners, one can wander or sit in the shade trees and enjoy this garden oasis. 5. Crickets’ Lullaby 8 p.m.
You’ll be ready for bed after your first exciting day at The Bay. Settle in for the night and let the crickets sing your kids (and you!) to sleep. 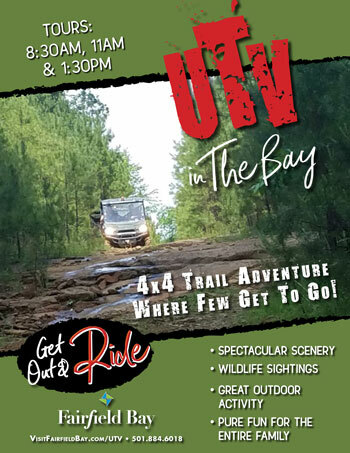 Today is family togetherness in the great outdoors in three areas: The Bay’s trails, Marina, and Recreation Center. If the kids don’t wake you at the crack of dawn, you may be able to enjoy your first cup of coffee with the pre-dawn calls of local birdies. 6. Morning Energy Boost 8:00 a.m.
Stop by Jack’s to grab your morning “cup of joe,” a fresh, ready-made breakfast sandwich or his famous ‘made from scratch’ cinnamon rolls. 7. Hit the Trails 9:00 a.m.
Let’s get that blood pumping! Fairfield Bay boasts miles of trails for all ages and abilities. a. For a quick, easy scamper, try the Indian Falls Trail. Just under a mile, this moderate trail has a beautiful path along the rum of Wild Horse Canyon. Two rock formations and two waterfalls provide a perfect adventure to start your day. A bench can be your respite while the kiddos explore nearby. No shortage of adventures and discoveries. Beautiful waterfalls and rock formations will keep the attention of everyone in the family, no matter now energetic or busy. b. 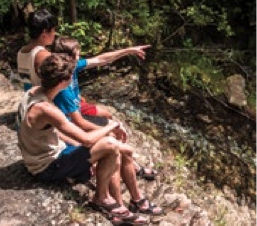 The Indian Rock Cave Trail is a 3⁄4-mile-long trail that is family friendly and offers a bit of history, too! After you explore the Old Log Cabin and Museum, pick up the trail. But before you begin, look for the bell for a fun ring-a-ding-ding! You’ll follow along the Indian Hills Golf Course, which rises and returns along bluffs. Explore the historic cave formation that has several Petroglyphs and rock formations with lots of nooks and crannies for youngsters to create their own adventures. c. Rambling Cove Trail (takes you to the Marina) is not to be missed. Feeling energetic? At the trailhead, look for a big rock shaped like a razorback, painted too! (The razorback is infamous in Arkansas, as it is the mascot to the University of Arkansas. If you want, “call them hogs” to start your hike!) The trail is fairly flat then steepens somewhat to its end with a beautiful scenic view of a cove of Greers Ferry Lake. While you’re there, you may choose to rent a paddleboat, a boat for fishing, or you may simply relax on shore to take in the views while you enjoy a picnic lunch. Or you might want to tackle ActionFit Exercise Equipment on the quarter mile paved loop trail. 8. Fast and Fresh Lunch 11:00 a.m. Since you’re right there at the marina, consider sandwiches from Captain Bailey’s Grub Hub for lunch. They are open weekends in the summertime, so simply hike over from the cove. 9. 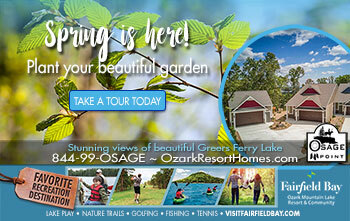 WaterPlay Destination: Fairfield Bay Marina 12:30 p.m.
Greers Ferry Lake is a family’s paradise! Dip in your big toe or really go for a swim; then branch out to just about any adventure on the water. • Rent a boat to pull the kids on a tube or on skis. • Paddleboards, paddleboats and kayaks are a fun way to see the lake. Summer fun on Greers Ferry Lake starts at the Fairfield Bay Marina. Rent a paddle board, paddle boat or a kayak and explore the beautiful scenery of the ‘north shore’. 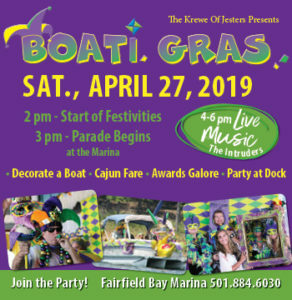 Rentals at Fairfield Bay Marina, 501-884-6030. • Explore the Marina’s full service shop and get yourself a fishing pole (reasonable prices), and some minnows, of course! 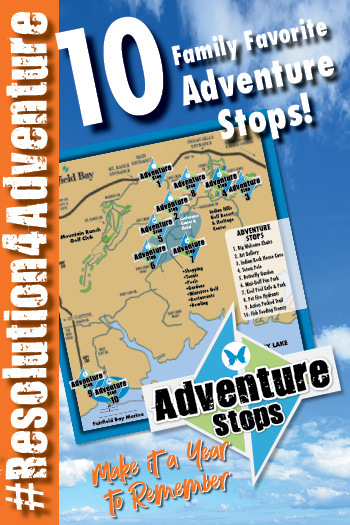 • You can fish from the cove (Rambling Cove is a great place) or from your boat. • A Fairfield Bay favorite (and great photo op) is the Fish Frenzy! For just a few quarters, you can get a bag of fish food and an hour of entertainment. • If you hiked down the Rambling Cove trail, before you hike back to your car, you’ll need a snack. Good thing the snack bar at the Marina is right there for you. 10. Recreation Destination: Tennis & Recreation Center 3 p.m. If you can drag yourself away from the marina, check out another family hub of outdoor entertainment, the FFB Tennis & Rec Center. 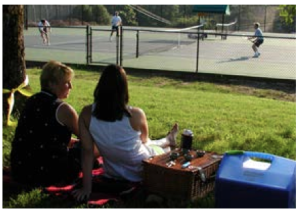 • You can play tennis on eight courts, two of which are lit for nighttime play. Tennis anyone? Grab a racquet and hit a few balls on one of the 8 beautiful courts. Or bring a picnic and enjoy the game with a snack. • Book a lesson with a tennis pro! Join the locals on Tuesday, Thursday and Sunday, or opt for a private lesson with the whole family. There are youth and adult specific clinics for all ages and levels. A nearby playground entertains little ones too young to swing a racket. After your match, cool down with a cool snack at Cool Pool Cafe. 11. Supper in the Ozarks 6:30 p.m.
At the rec center, you can prep your own supper on the big party grill. If you’d rather dine in, pop on over to Stringbeans, a local favorite. With a friendly staff, and dishes prepared with locally grown produce, it’s a great way to finish off your day at the Bay. 12. Entertainment and Theater 8 p.m.
Every week in the summer, after dark, the BayView pool at the Rec Center and Cool Pool Cafe features unique entertainment while you swim. Or check out the Our Towne live theater troupe at the Convention & Visitor Center. Plus, every Tuesday, May through September, you won’t want to miss the hilarious Gomer & Patsy Show. 13. Goodnight Moon 8 p.m.
A full day at The Bay makes bedtimes easy! Let the tree frogs and crickets tell a goodnight story. It’s your final day! Where did the time go? Today you’ll want to catch a quick game of golf and grab a few postcards before you head out. Pack up your camp or villa and get ready for your last day at The Bay. Will you enjoy breakfast camp side or on the deck? Or will you pop out to pickup a quick bite and share some pancakes with the locals at the Lions Club Pancake Breakfast (Tue & Sat). 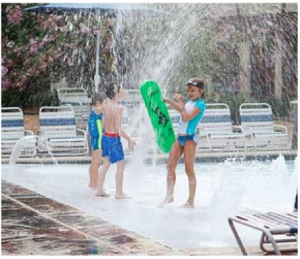 “awesome!” kids zero-entry swimming area with multiple spray features and water walls. 15. Tee off! 8:30 a.m.
You have just enough time to squeeze in a round of golf before you leave. Indian Hills Golf Course is carved into the hills and valleys of the Ozarks, offering some breathtaking views and challenging golf. If you haven’t already hiked Indian Rock Cave Trail, be sure to check out Indian Rock House located off number nine fairway. 16. Top it Off 12:30 p.m.
Top off your visit with lunch at The Little Red Restaurant. Winner of Trip Advisor’s 2015 Certificate of Excellence and adjacent to the golf course, it’s the perfect place to fuel up for the trip home. Grab a few postcards from the lobby to remember your stay in The Bay. 17. 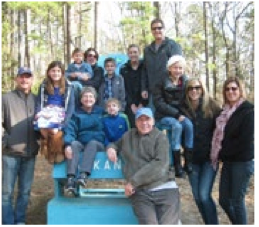 Family Photo 1:30 p.m.
As you exit The Bay, gather the family in the iconic Giant Chair (and we mean the entire family… yes, you’ll fit!). We think this just might be your holiday card photo!